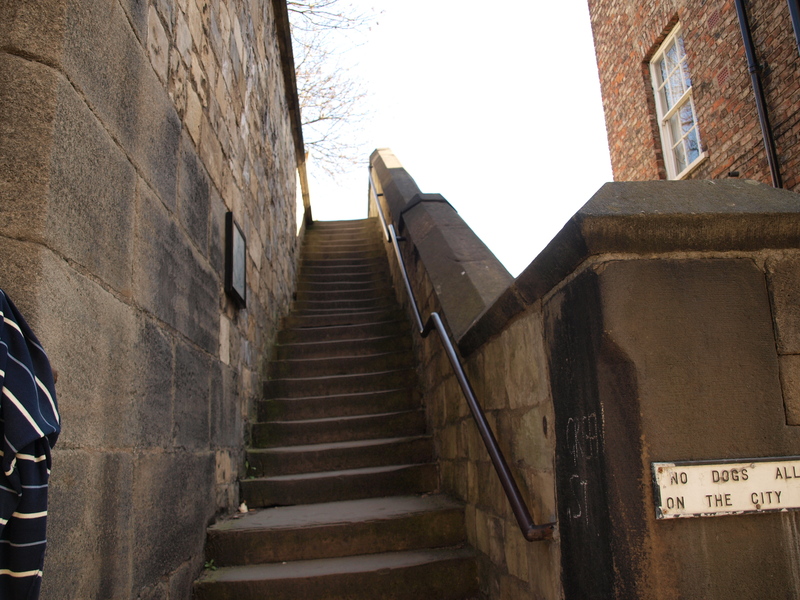 Part one of this corner starts with the roofless steps going up to the Walls at Monk Bar and ends where the Walls end. As soon as you get to the wall-walk you’ll see musket loops, these are probably from the English Civil War, to be aimed through by a kneeling man. 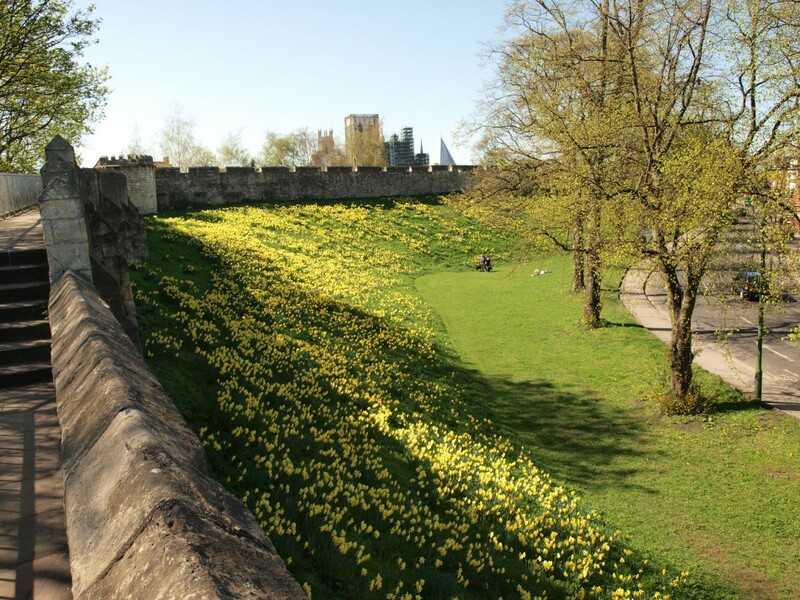 The wall-walk you are on is probably from the late Middle Ages, though Victorians repaired it and the battlements. Just past the guild hall, on the wall-walk but partly behind railings, there is what’s left of two toilets. These may well be medieval, opinions differ on who would have used them though they have been described as extremely public public toilets. The next tower has been rebuilt by Victorians –with chimney-like little turrets. Outside the Walls around here you begin to see a three story car park, it is built on the site of York’s medieval Jewish cemetery. The area is still called Jewbury but it was long uncared for as all Jews were expelled from England 700 years ago [only returning gradually after more than 300 years]. 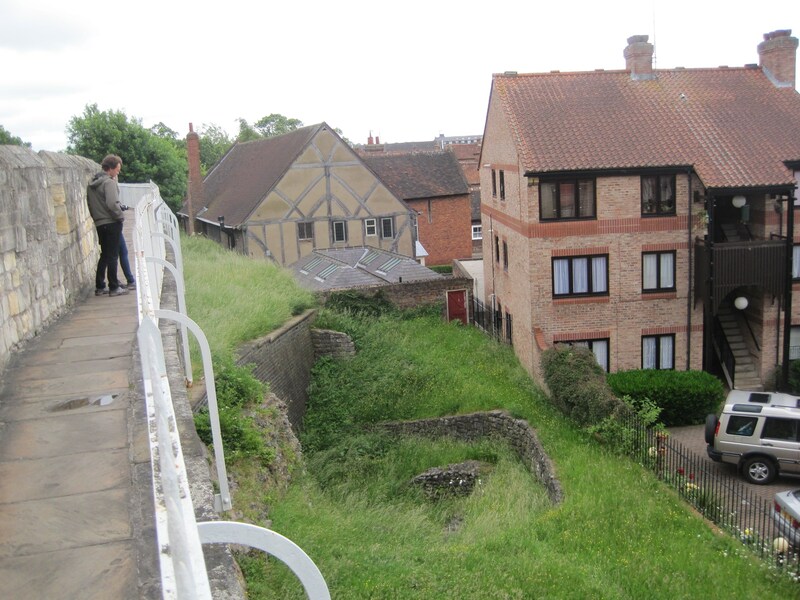 At the next tower the walls turn outwards and there are good views looking back to your left as the Walls go down to the River Foss. Some say the musket loops were higher before Victorian restoration and were for a musketeer standing with the gun against his shoulder. At least one of the loops [just after the steps up] seems to have been created by filling an embrasure in the battlements. The place for the best view of the ice house is shown by an ice symbol set in the paving of the wall-walk. The house is a bit like an igloo in reverse, it is built with brick but is mainly under ground and was made around 1800. It could be filled with ice in winter so that this could be used throughout the rest of the year for iced foods and drinks. On the opposite side of the Walls at this point you can see you are immediately above the excavated remains of a Roman interval tower in the walls that surrounded the legionary fort 1800 years ago. The first excavation here was in late Victorian times, the last was in the 1930s. The hole the archaeologists have left gets deeper further along the Walls so there you can see a tall wall by the corner of the fort. 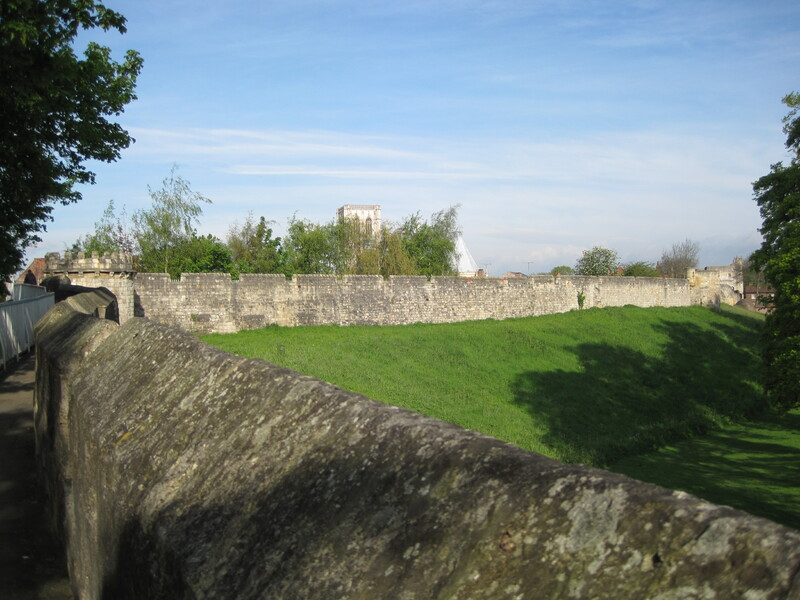 You can see these towers do not stick out from the Roman walls so defenders in the towers could not have attacked hostile Britons from the side as they approached the walls, perhaps the Romans did not fear this sort of attack. 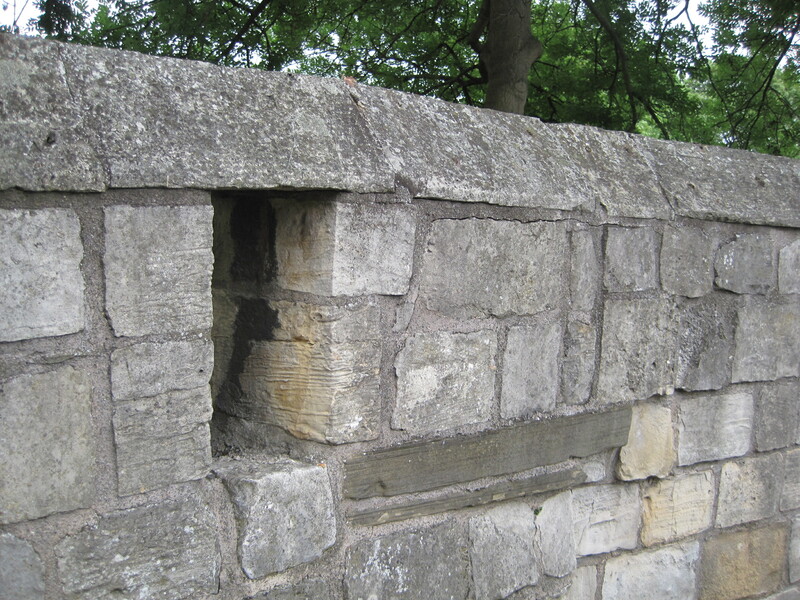 There is an information board on the wall-walk’s railings about the Roman walls. The medieval guild hall is one of several that survive in York. The guilds were part trade association, part charity and part religious fellowship; usually you had to join one if you wanted to do business in the city. Tailoring was one of the biggest trades in medieval York, there were 128 master-tailors in 1386 when records started, these were the full members of the guild –allowed to employ journeymen [paid by the day] and apprentices who would usually live in a master’s home. At a round tower [called “New Tower” since 1380] the Walls suddenly turn outwards, probably on Norman ramparts, to protect the medieval church of St. Cuthbert’s. 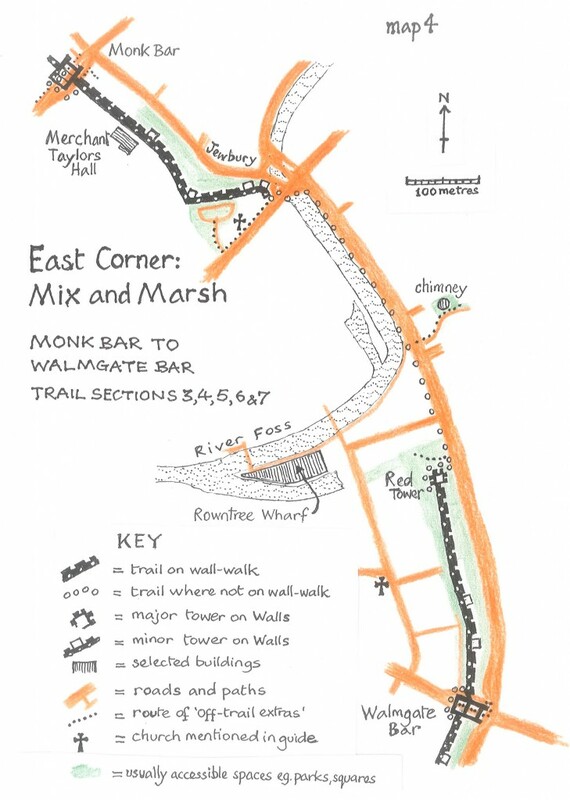 There is a small, quiet public garden immediately below you on the right; this is described in “Refreshments, Seats & Toilets” in the Appendix and as an off-trail extra for part 2 of this corner. 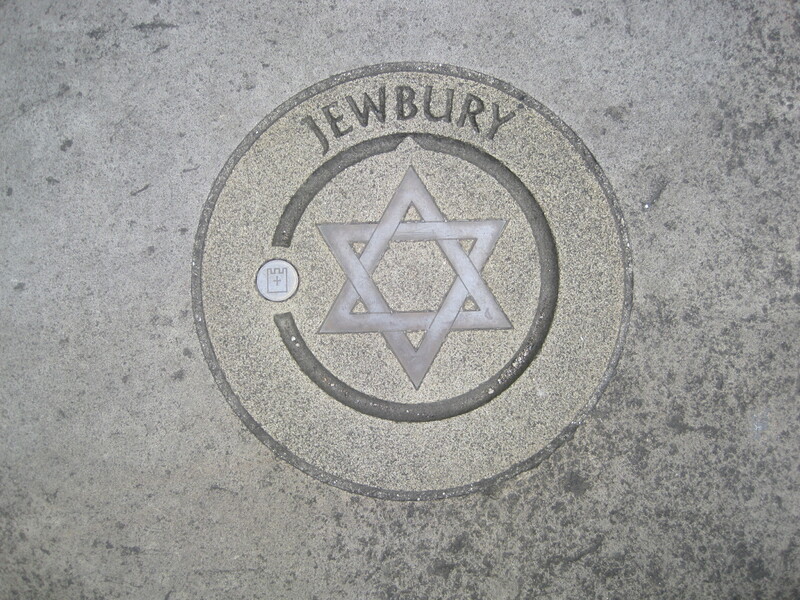 From just past the guild hall: The wall-walk soon narrows so it may be best to look around you before you get to where the best view of Jewbury is shown by a star of David set in the paving of the wall-walk. Most of the site of the cemetery is now covered by the Sainsbury’s car park, you can see the modest, metre high, red granite plaque, commemorating the dead, set into the nearest part of the car park’s red-brick wall; its story is told below. To the left of this is Georgian housing. Turn further to the left and you are looking back at the Minster. The modern housing between you and the Minster here is very popular, and is thought of as successfully bringing people into the city to live. This was a major planning aim in the 1960s. Looking forward you’ll see the ramparts and Walls turn east and get lower –but the best views of these is about 25 metres further on where you can also see New Tower [round with long arrow slits] and where the Walls and ramparts end with two older, more angular towers, the first with shorter “musket loops”. 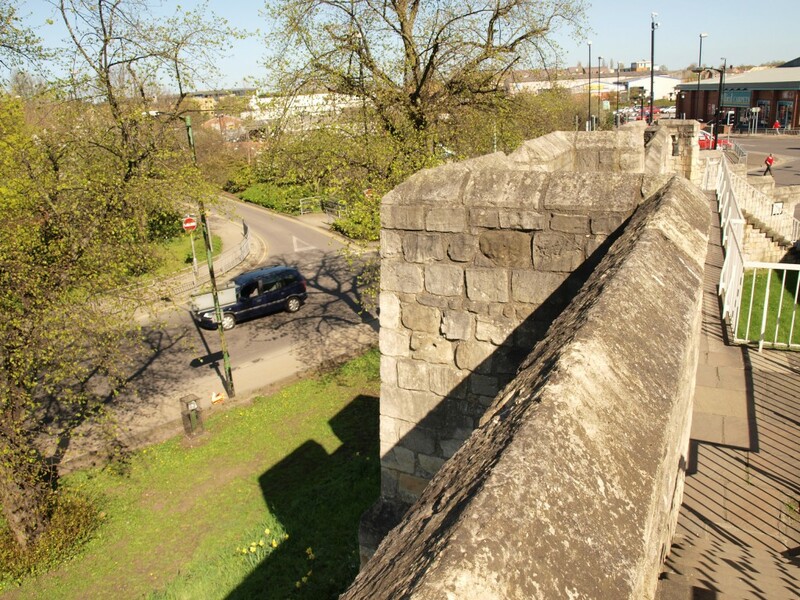 From just past New Tower: There are good views looking back to your left: a hint of a grassy ditch, the ramparts, the Walls, Monk Bar and a little of the Minster. It is unusual for an old place name in York to be so clear and helpful but, partly by accident, the place where medieval Jews buried their dead in York has long been called Jewbury. 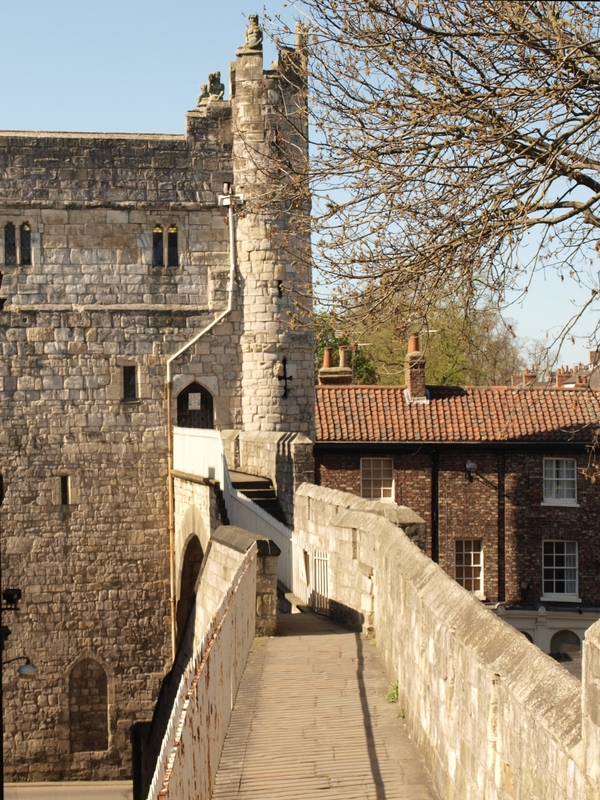 There was a thriving Jewish community in 13th century York. Its members must have felt vulnerable as their religion made them the only religious minority in the country and meant they were excluded from membership of the guilds which controlled most trade in the city. They must have known of the terrible end of the 12th century York Jews [see South Corner, part2: The Saddest Story]. and cursed be he that moves my bones”. But all Jews were expelled from England in 1290 so they could no longer take care of their cemeteries. Almost 700 years later in York there were just a few documents that suggested that there was once a cemetery where holes were to be dug as part of new building in “Jewbury”. 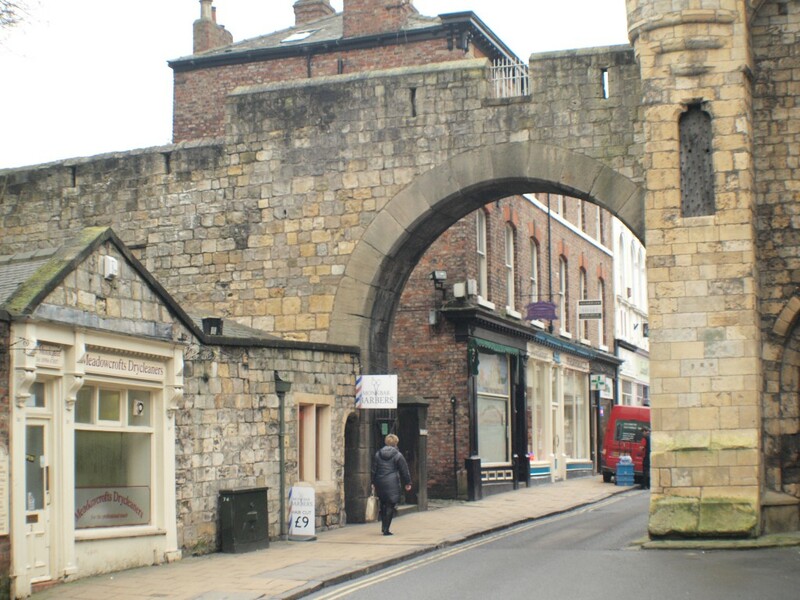 Archaeologists were called in to investigate the site before builders moved in, this respect for the archaeological evidence that might otherwise be destroyed by building is legally required everywhere in old York because it is a designated “Area of Archaeological Importance”. The archaeologists discovered about 500 medieval graves and the skeletons in them –and wanted to dig further and do tests on the bones and teeth to discover more about the diet and health of the times. 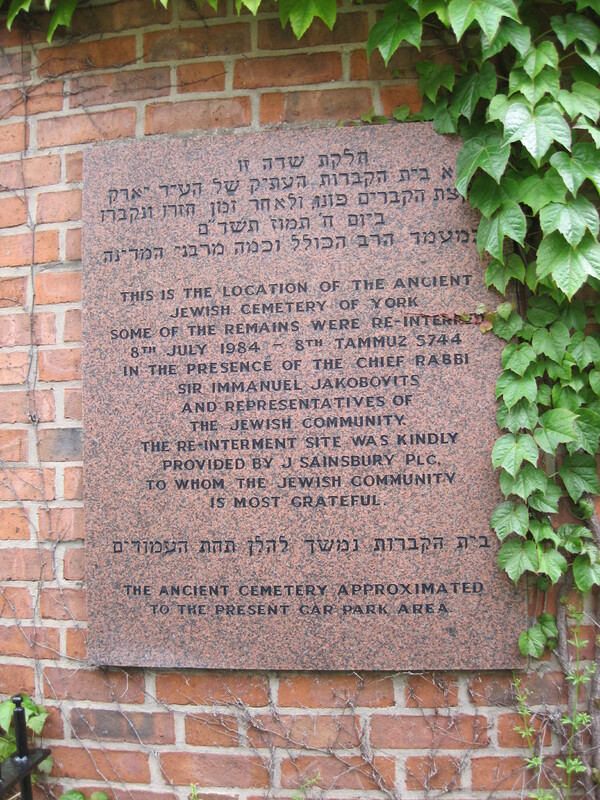 But, in spite of the lack of gravestones and lack of traditionally nail-less Jewish coffins, the care that had been taken in the lay-out of the graves helped make the archaeologists and modern religious Jewish authorities in England believe that this was a Jewish cemetery. This being so, the archaeologists felt they should do as the Chief Rabbi wished. This ended their research as what he said was: “Whatever the scientific and historical loss… the dignity shown to humans even centuries after their death can contribute more than any scientific enquiry… to the respect in which human beings hold each other”. The skeletons were removed to a Jewish mortuary and then returned to Jewbury for a burial supervised by the chief rabbi in 1984, seven centuries after they were first buried..